What is Knexus Customer Services? 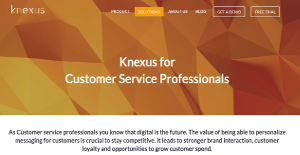 Knexus Customer Services is a platform that enables customer service teams to distribute personalized content experiences to any digital touchpoint, for individual customers or target audience segments of choice. The solution easily integrates with other apps such as your brand’s CRM, DAM, CMS, and marketing automation software via the flexible API. Knexus personalizes content through predictive or rule-based targeting and automatically delivers that content across channels. The system offers powerful insights with a complete view of your content and customers across those touch points and has impressive real time optimization capabilities. With Knexus, you can deliver personalized content experiences into your mobile app, in real time. Plus, you can greet your customers with the most relevant, valuable content. Knexus helps deliver deeply personalized content onto mobile apps by matching individual customer’s profile data and transaction history with the brand’s most relevant content – all in real time. Choose to deliver content experiences automatically or through smart content recommendations (approved by you) to the app of your choice. By providing real time, personal experiences, your brand can add value, increase brand loyalty and grow repeat business from satisfied customers. Knexus platform analyzes customer data using machine learning and predictive analytics, to understand your customer and what they’re looking for in their digital journey. Simultaneously, it searches your video, blogging, social and other marketing content across CMS, DAM, blogs and social channels, using deep learning algorithms, to understand what that content is. Knexus algorithms then match the customer data to product, marketing, and social content, delivering highly targeted content experiences in real time across email, websites, mobile apps, eCommerce, or other digital channels. Your brand is collecting a rich selection of behavioral, transactional, analytical and other data. Knexus uses this data to better understand your customers, their journey and what content experience will match their expectations (and your objectives). Knexus uses machine learning and predictive analytics to understand a customer in terms of their profile, journey, affinities, and interactions. It utilizes data from multiple sources including CRM, eCommerce, social listening, and analytics. You can fine tune the customer intelligence algorithms directly from the app’s easy-to-use interface to improve performance. Knexus offers one view of all online content. It gives your team fast and easy­to-use options for delivering personalized content into digital channels, based on your marketing objectives. Knexus automates delivery, unburdening your to team to focus on higher value efforts. Meantime, the platform reaches your audience with ultra targeted messaging, in real time. Using real time optimization, Knexus continuously monitors both customer behavior and the latest available content, to provide the most compelling experience for your audience. As a result, you can achieve the best possible performance whilst freeing up vital team resources. Integrated analytics attribute value and measure content performance, engagement, and user behavior. With customizable dashboards, powerful reporting options, and seamless integration with tools like Google Analytics, you quickly generate actionable insights to achieve your goals. Knexus has a reputation for fast time-to-value. The simple, intuitive interface puts non-technical users at ease. The platform has low complexity to set up and ready-made plug-ins to integrate seamlessly with other systems. Knexus provides a flexible and agile solution for specific campaigns or enterprise wide content personalization requirements. Use one or multiple data and content sources, and deliver content experiences across your choice of digital channels. If you are interested in Knexus Customer Services it might also be a good idea to check out other subcategories of Best Customer Experience Management Software gathered in our database of B2B software reviews. Each enterprise has different wants and requires an application that can be personalized for their size, kind of employees and clients, and the particular industry they are in. For these reasons, no system can provide perfect features out-of-the-box. When you look for a software system, first be sure what you require it for. Read some Knexus Customer Services reviews and ask yourself do you want basic features or do you require complex features? Are there any industry-specific tools that you are seeking? Obtain the answers to these queries to aid your search. There are plenty of elements that you need to consider and these include your budget, particular business requirements, your organization size, integration requirements etc. Take your time, use a few free trials, and finally select the platform that presents all that you require to boost your organization competence and productivity. How Much Does Knexus Customer Services Cost? Solution and pricing based on your company-specific requirements. We realize that when you make a decision to buy Customer Experience Management Software it’s important not only to see how experts evaluate it in their reviews, but also to find out if the real people and companies that buy it are actually satisfied with the product. That’s why we’ve created our behavior-based Customer Satisfaction Algorithm™ that gathers customer reviews, comments and Knexus Customer Services reviews across a wide range of social media sites. The data is then presented in an easy to digest form showing how many people had positive and negative experience with Knexus Customer Services. With that information at hand you should be equipped to make an informed buying decision that you won’t regret. What are Knexus Customer Services pricing details? What integrations are available for Knexus Customer Services? Knexus easily integrates with other tools such as your brand’s CRM, DAM, CMS, and marketing automation software via the flexible API. If you need more information about Knexus Customer Services or you simply have a question let us know what you need and we’ll forward your request directly to the vendor.